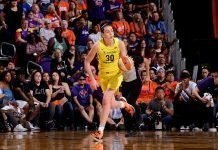 In the Mercury’s 87-69 rout of the Sky, Diana Taurasi passed Katie Smith as the WNBA’s second all-time leading scorer. Also, the Fever won for the second night in a row by edging the Mystics, 80-77. Nadirah McKenith is her family’s star. Defense was stressed in today’s practice. Brittney Griner talks shot blocking, and the Mercury season. The Sun are searching for a win and some momentum before hitting the road. (Chelsea) Gray matters, volume II. A minute with Emma Meesseman. New Minnesota coach Marlene Stollings has hit the court running. She has assembled a diverse group of assistant coaches. Melissa Dunne is George Washington’s new assistant coach. Dan Doerflein has been promoted to assistant coach at Drake. Katherine Graham joins Lipscomb as an assistant coach. Adam Call is a new assistant coach at Stony Brook. George Mason has added three transfers: Kara Wright, from Southeast Missouri State, Mikala McGhee, from Missouri State, and Tiffany Padgett, from Loyola Maryland. Purdue center Camille Redmon won’t return for her senior season. Sarah Livingston is leaving Illinois to play volleyball at USC. Danielle Donehew has been named the WBCA’s new executive director.